What happened in London on 311? It’s as I’ve been saying all along… they are sewing up the people by using fear so as to ensure they have complete and utter control globally. The mark of the beast must be enforced, but it will never be enforced unless they do as Revelation stated they must do. They must “speak and cause” many strange laws into effect that will prevent anyone that seeks to ignore the global mandate of Sunday laws a way of escape. The airlines are sowed up thanks to the government sending it’s own planes into the Twin Towers, as well as performing a planned demolition on them to ensure no one would be able to investigate the wreckage. By the way, how many of us believe a 143 foot long, 125 foot wide, and 30 foot high 767 created a 16 foot hole in the Pentagon? AND LEFT NO WRECKAGE OR CARNAGE? 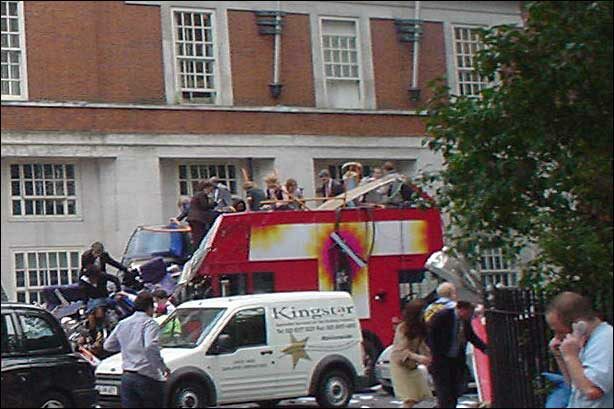 Now that the 3/11 bombings in the trains in Spain were unable to get public approval for tougher laws on the masses, they obviously needed to repeat it on 7/7/05 in London to rekindle the fear. If you notice they seem to be a bit more organized in having everyone ready and waiting to speak out about it. For example, I was watching FOX news on 7/7/05 and mayor Daily had every single head official from the police, all the way down to the sewer workers assuring the people that all avenues in the city are being totally secured and sewed up so tight that even a cockroach would have a hard time getting in or out without their knowledge. Keep in mind people, Chicago is also the one spear-heading the bullet proof cameras on city street corners in what they refer to as bad areas of the city. The cops can view or even manipulate the cameras so as to zoom in on who is committing crimes anytime of the day or night. PLUS, those cameras are also designed to lock in on gunfire from what I understand. So.. what do I think about London and their so called terror attacks? The governing powers of the world are merely being used by Satan to gather the people into nets so as to ensure an easy global takeover when that day comes to enforce Rome's mandate. They cannot enforce the mark of the beast without locking every avenue of escape down tight. And thanks to the GLOBAL and NATIONAL ID cards that are to be introduced in May of 2008, they will have the ability to "flick a switch" if in fact you slip under their dragnets. All your cash, credit cards, or even personal data will be blackballed on computers across the globe. At the same time you try to use your REQUIRED BY LAW ID CARD the computer will alert every police officer nearby of your location. By the way, it’s about to get worse if you can believe that. The governing powers are about to graphically more barbaric as things progress closer to that day. In fact, they are even testing torture on "Christians" in Oxford university as we speak! The Roman catholic church has used this approach during the dark ages, the inquisitions, during the prophecied 1260 years, they even instructed Hitler on how to use this as well. It's historic fact that Hitler was a Catholic. Rarely do you hear of the church’s direct involvement in any of this however. It’s always done behind closed doors so as to keep it’s moral front intact. Still, no matter how much they try to hide it, it always seems to come out in the open. And yes, just before Christ returns everyone will know it was the Vatican that manipulated the governments and talked them into doing these terrorist acts. How do I know this? Prophecy plainly reports that soon EVERYONE that was originally controlled by the Whore of Babylon will come to hate the whore. Revelation 17:16-18, "And the ten horns which thou sawest upon the beast, these shall hate the whore, and shall make her desolate and naked, and shall eat her flesh, and burn her with fire. For God hath put in their hearts to fulfil his will, and to agree, and give their kingdom unto the beast, until the words of God shall be fulfilled. And the woman which thou sawest is that great city, which reigneth over the kings of the earth." Before 911 the American people were asked if they wanted armed guards on airplanes. We said NO! Directly after 911 the American people BEGGED for more security and armed guards! With each so called terrorist attack comes new laws that the beast will "speak and cause" to go into effect that will ensure less freedoms and more control for the powers that be. Bottom line: THEY CANNOT enforce the mark of the beast without these laws in place. They will never be able to ensure ALL people on earth will either receive the mark, or be killed for refusing unless they have control over the air, land, sea, and your livelihood. What's next? It's in your Bibles! Politics: 18 July 2005, Monday. British police Saturday night released a picture of the four London bombers being together as they set off on their deadly mission last week. 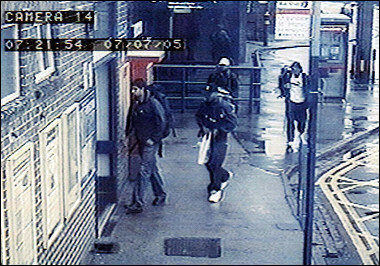 A security camera captured the four men entering Luton railway station, just outside London, at 07.21 local time on July 7 on their way to the capital. In the photograph, the four men were dressed casually and appearing relaxed, with backpacks on their shoulders, which are thought to contain the bombs which tore through London's transport system, killing at least 55 people. The Sunday Times reported that one of the four suicide terrorists was scrutinized by the British Security Service, or M15, last year, but was judged not to be a threat to national security. As you can see, I have both the source of the article as well as the picture listed above, which by the way have NEVER been pulled off the Internet even though the general public now knows the photo was doctored. I would also like to solicit anyone that may have a copy of this picture in their local Newspaper. If the corrupt officials ever decide to delete this picture from the Internet, they won't be able to delete it from an already printed newspaper. So if you have a copy please mail it to this ministry at your earliest convenience. So.. how was the photo doctored you ask? Looking at the picture of the so called terrorists entering the train station appears quite normal at first glance. Nothing seems to be amiss. However, if you look a little closer at the accused terrorist with the white hat in the back you may be a bit surprised. Look very closely at him, he’s the one that is about 4 maybe 5 feet away from the rail fence that seems to encircle the area. Look even closer at his left arm. Notice anything strange about it? That’s right! The lower part of his left arms is STILL BEHIND THE FENCE! However, the upper part of his left arm including his shoulder is still about 4 or 5 feet in front of the fence. Stranger still is the fact that his head also appears behind the fence! In other words, the London police FAKED THE PHOTO! And they did a childishly lousy job at it! Truth is, I believe they messed it up on purpose for a reason that I will get into later. Even a child can see that these four guys were simply photo-shopped into the picture. However, the last guy with the white cap must have had a strange resolution problem that caused part of his left arm to lay behind the background graphics and at the same time his head jumped forward. As one that uses graphics on a daily basis, I can tell you from experience that this is a common occurrence in arranging positions of graphic layers. Sometimes part of a layer will hang out in full or as is the case here, "partially," and you will need to push it back repeatedly until you get the layers in line for the desired effect. It seems they have an inexperienced man working in the London police department. The obvious question has to be, why would they fake the photo? 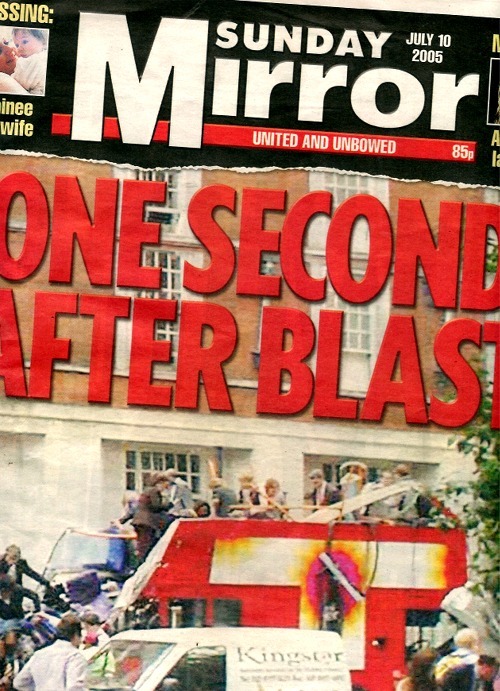 Could it be there were NO "REAL" TERRORISTS in London that day? Whatever the reason, it has now become clear that the governing officials that actually did the bombings needed to fabricate a fallguy. Or in this case, a group of them. Why do they do this? Well, one obvious reason has to be that fear moves the masses. If they can generate enough fear in the people they can get them to agree to all sorts of strange laws designed "to protect them," when in fact the laws are designed to CORAL THEM for later implementation of the mark of the beast! "At first, (almost) everything looks fine, but look closer... look at the guy with the white hat... check out his left arm (HIS left arm).... the lower of the rails of the railing is IN FRONT of his left arm... where of course it shouldn't be! I'm NO image specialist, but this sure looks ridiculous. I'd say it´s a fake." The CLG has also inspected this image, and found that... "The white-hatted man was apparently superimposed onto the photo. Not only is his arm 'behind' a railing that is supposedly several feet behind HIM, but also, upon magnification in Photoshop, part of the bar actually goes into his head. This was 'touched-up,' but pixels of his head mix unmistakably with pixels from the railing." --Michael Rectenwald. Notice the following computer enhancement of the same picture below. 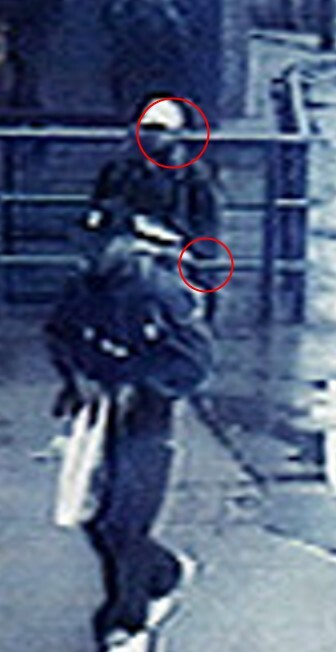 You can clearly see the railing appears IN FRONT of the so called bomber's left arm. Not only that but there also seems to be a railing running through the man's head. 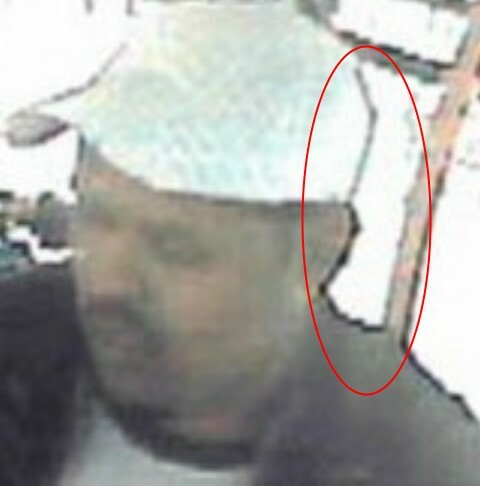 Notice also that there is a noticeable outline like a black halo just above the so called bomber's cap around his head. 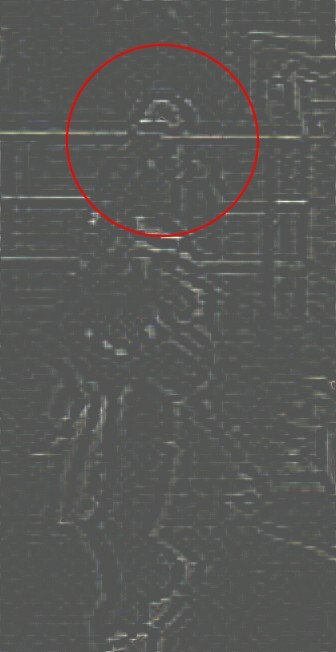 This indicates that the image has been clearly "cut out" and superimposed onto the original background that the police said in the Sofia News Agency article earlier was an actual photo from the train stations security camera. Notice the photos show clearly the pictures were doctored. The "bar through the head" especially proves this out. 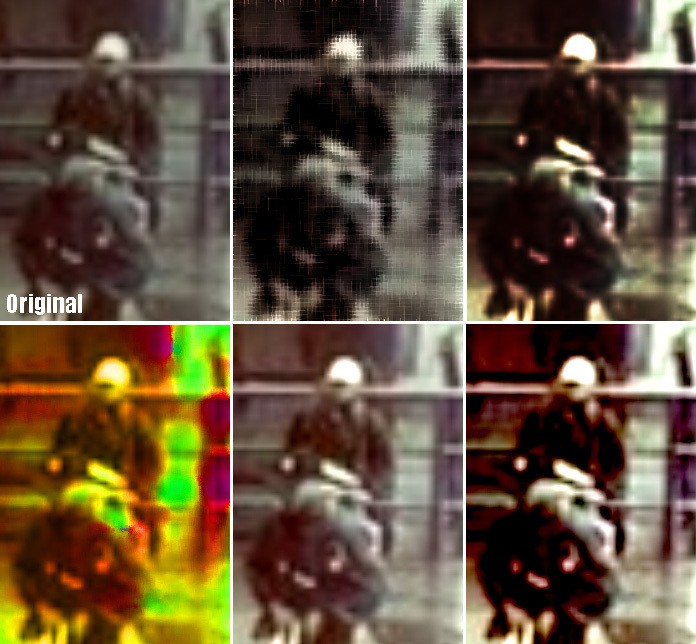 When enlarging and filtering with different colors one can see the pixelation and what's referred to as "blooming" much clearer in the photo. "Blooming" is nothing more then brighter pixels bleeding across the darker colors. 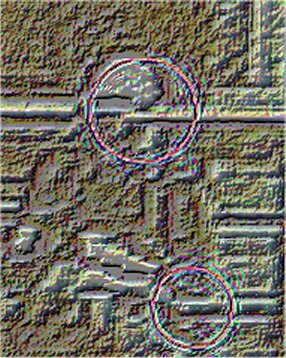 Some graphic artists liken the effect to pixel noise. Is all this fakery the norm here? For London this appears to be the case. 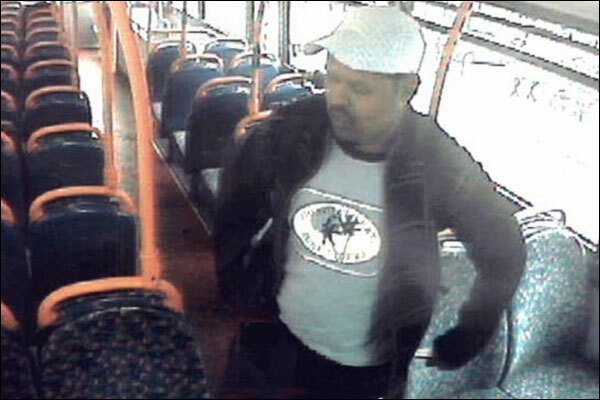 Not too long ago London newspapers both on and offline released a photo of what they referred to as the Hackney Road, Shoreditch Scotland Yard bomber on what appears to be a bus. Notice if you will yet another obvious fakery of the British police. This one is even easier to spot. Take a look at his hat. Also notice the right most edge of his ear as well as all the way down his arm. Notice anything strange? Look closely and you will see that his WHITE hat is in front of a very bright white background thanks to the daylight streaming into the bus window. Ordinarily, the lighter colors would blend together and wash out as you see the seat railing doing directly behind his left arm. Sunlight doesn't create black outlines on chrome, let alone on a white hat! Look closely at the hat and you will find that even though he is standing in front of the brightly lit window, his white hat has a BLACK BORDER! Also notice how large the same black border is around his ear and his arm. Looking below this photo at the ZOOMED IN picture of his head and shoulder, one can see clearly his original background was much darker then that of the bright window now behind him! Let's take a close look at it to get an idea of what's really happening here shall we? Notice the white van? See the name on that van? It says Kingstar and it has a large gold star as a logo on it. Now, click the LINK I placed directly under that photo. It will take you directly to the website of Kingstar itself. That’s right… Kingstar is a professional demolition company! Whoever snapped the photo did so a bit too quick for that Van to get out of the area after the blast. At first I didn’t think much of it, but now that they removed it from the sites I originally saw them on, it seems a bit obvious they are trying to hide, and or protect their demolition experts. Were they there to gloat over their work? Inspect their damage? Who knows. It just seems a bit strange is all and thought it would be worth noting. So.. why all the obviously doctored photos? At first glance one would think they have a 12 year old running the graphics department in the London police. But after realizing almost two months have gone by and these photos are STILL online in the original news sources, we can only come up with one conclusion. The police and governing officials are boldly proclaiming that they have assumed control, and there is nothing we can do about. Now, don't get me wrong, I am not saying they are shouting this to ALL the people of the world. Most will agree that the grand majority of the people on this planet won't care or even bother to investigate this stuff. They just go along with whatever the government spews out. Truth is, the corrupt officials know they can get away with this or any other bold faced lie without a problem because of widespread complacency. They even know that they can and have been actually proven to be bold faced liars without as much as a slap on the wrist. Case in point, how many of us have the grand lack of gray matter necessary to cultivate the belief that a 143 foot long, 125 foot wide, and 30 foot high 767 created a 16 foot hole in the Pentagon? Yet left no wreckage, dead bodies, or even so much as a dent in the ever present and pristine front lawn of the Pentagon? And why is it the Pentagon, the most secure building on earth that is literally drenched with security cams head to toe has never released a single pixel of any photo proving a 767 did the damage? What's worse is the media keeps pumping this obvious lie and no one is doing ANYTHING about it! Well... that's not altogether true. There are some of us that do alert the people as best we can. But since the mainstream media won't allow us to speak on their TV stations, place flyers on any cars without local government approval, or even be allowed to call into a live radio program, we resort to websites, shortwave, and even Satellite as well as Internet radio to warn the masses. Praise the Lord there are still a few small AM & FM radio stations that allow such truths as this to be shared with their listeners. It is before these people the government is flaunting the lie of 911 as well as July 7. They know the majority fall for their idiocy, so it is only those of us that know the truth that they seek to anger, upset, or even frighten. Think about it! Big government leaders know full well there are over 6 billion people on the planet. They also know that only a fraction of them have enough guts to speak out. It is also common knowledge among these corrupt officials that our ability to speak is greatly limited due to all the media blackouts, or blatant refusal of any media outlet to allow the truth to be shared with millions. Years ago you would hear of a reporter being threatened and yes, many times you heard of them being murdered after they were found digging into illegal government activities in the hopes of making life a little safer by removing the corrupt leaders from office. No longer do you see this happening. Either they have ALL been threatened and or murdered off, or the methods by which the schools that teach these reporters have been instructed in what is allowed on the air and what will cost them their careers if spoken. Sadly, it all falls back to MONEY being the god of choice in the world. No longer do people have an absolute authority in God. They are more fearful at losing their money and creature comforts then they are at falling into the hands of a wrathful God. And when they slip up in reporting something they shouldn't have, as we saw back in Oklahoma when the cameraman zoomed in on that SECOND BOMB in the building, that newscast was never to be found again after that day. I know, I was watching CNN the very moment that camera zoomed in. I saw the bomb taped to the girder and I also saw all the people that moments earlier were running into the rubble to help out, were now running out yelling about the bomb they saw! And then 22 minutes later when the broadcast made it's full circle to repeat, for some reason that portion of the broadcast was deleted and never aired again! Why wasn’t it allowed air time? A second bomb taped INSIDE the building proved it to be an inside job. I guess that blunt reality was too much for them to spindoctor. I guess the fact the explosion left evidence it wasn’t done by a truck parked out front didn’t matter. Or the fact all the higher officials that worked in that building for some reason had that day off. I guess those little facts are easy to hide, but a video of a bomb taped to a girder and hundreds of witnesses shouting about it was too much for them. So.. they snipped it out. Another and more plausible slant on this is of course a prophetic fulfillment being realized in all this. The mark of the beast in Rome is to be enforced whether we as a people choose to believe it or not. As Revelation 13:15 states, unjust laws must be legislated and enforced to bring that to fruition. They can’t enforce the mark while the people have freedom to walk onto any train, plain or bus, and eventually their own family cars. Problem is, the people of the world don't particularly like the idea of being controlled or boxed in like sardines. They would protest any and all attempts of the government to control them and lock them down. However, if you blast a train, a bus, or a plane and yell TERRORIST! Then you have all sorts of people begging for stricter laws on every man woman and child on the face of the earth. Look at the facts my friends. WE KNOW the officials are corrupt. WE KNOW they’re lying about 911, July 7, and a host of other atrocities. Since we know they are lying, and they don’t really need all these laws on men to help protect against terrorists. Why are they pushing forward on this? Is it a Hollywood movie type scenario where we see a mad scientist hell-bent on ruling the world? Seriously! Think about this at least for one moment! Let’s forget about religious boundaries here for a minute. It no longer matters if you’re a Christian, a Buddhist, or a Muslim now. We’re all in this together as human beings! Seeing how all the facts are undeniable and we know their reasons for controlling the masses are all lies. Then only one plausible answer is that the Christian prophecy regarding the mark of the beast must be correct! The mark of the beast IS the ONLY thing that makes sense here. They aren’t corralling the masses for security because it’s a farce. They are corralling them for the mark! They aren’t securing the borders, and asking for global ID’s because of terrorists because we already have proof THEY ARE THE ONES doing the terrorist acts! Only the Christian Bible with it’s proven 100% accurate prophecy is the one to trust. And that my friends is also why this Bible has become hate speech in some nations! Christians that understand prophecy know this full well. We also know that this is one of the main reasons the powers that be are keeping those doctored photos online. They want those of us that know about their actions to see those photos! It's "quietly" saying to all those that would speak out, or those that understand prophecy that THEY KNOW, WE KNOW THEY'RE DOING IT! And at the same time they are shouting boldly that they think we can do nothing about it simply because they control the media as well as the military. There is however one major flaw in their assumptions. There is one that can and will do something about it very soon. His name is Jesus Christ. When He returns He will be stopping them dead in their tracks. By the way, there is one you could compare to a mad scientist. He seeks to rule the world and he even demands worship of men as did Pharoah and Caesar did in their day. Listen to the following quotes from the Roman Catholic Popes. I have literally hundreds of quotes like these on the “words of a beast” page in the warnings section of the site. I am going to place a few in order to try and generate an echo we have all heard in Scripture long ago. First I will read Isaiah 14:12-14 and then I will read the quotes from the Popes of Rome. Now I know this won’t open all eyes, because some are desitined to burn. However, it will open the eyes of the elect. I say to you today, it’s time to get to work. What are you waiting for? Is a career on earth worth more then eternal life? London government protecting man that bombed them?